We asked him if he could elaborate. There are several things that you can do, and strategies that you can exercise, that will allow you to do little—if any—damage at all, meanwhile allowing you to have fun, enjoy your meals, and experience the most of your traveling. After all, when you return from traveling, you don’t want to have to start from square one all over again. The first suggestion our personal trainer in West Hartford gives is, Do the best that you can. Everyone’s travel circumstances are going to be different. You may be in a strange country, or in the heartland of the United States. Food variety, specialties and even availability will vary vastly. The idea is to do the best you can with what you have around you, while simultaneously allowing yourself to enjoy your food. Do not freak out if you go overboard one meal or even a couple of them. The second thing he suggests is to eat REAL food most of the time. That means lean proteins like fowl, fish, eggs, and even lean beef or pork, fruits and veggies, nuts and legumes, and maybe small amounts of bread or whole grains. Don’t opt for the “deep-fried everything,” at every meal, every day. Food that is “roasted,” “broiled,” “sautéed,” “braised,” “grilled,” can be just as delicious as food that is “fried,” “deep fried,” or “crispy.” Attempt, also, to have a lean protein source and at least one vegetable at every meal. The third thing our personal trainer in West Hartford Connecticut tell us is, Remember that liquid calories are dangerous; be mindful of them. Keep alcoholic drinks for special occasions on your trip, and try to stick to water 80% to 90% of the time. The fourth suggestion given by our West Hartford Connecticut personal trainer is Moderation. He recommends trying your best to make 75%-85% of your meals healthy, while traveling, and then allowing yourself to eat mostly whatever you want the rest of the time. This will allow some room for indulgence. It essentially means finding balance with your eating. “A good rule of thumb is to never consume two unhealthy meals back-to-back,” says our personal trainer in West Hartford Connecticut. 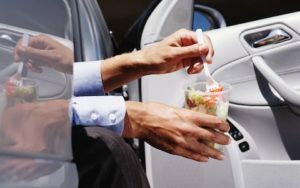 If you adopt these balanced, moderation-centric suggestions, instead of an “all or nothing” approach, you will find that you feel even better when you are back from your trip.